The extinction of the passenger pigeon is a poignant example of what happens when the interests of man clash with the interests of nature. It is believed that this species once constituted 25 to 40 per cent of the total bird population of the United States. It is estimated that there were 3 billion to 5 billion passenger pigeons at the time Europeans discovered America. Early explorers and settlers frequently mentioned passenger pigeons in their writings. Samuel de Champlain in 1605 reported "countless numbers," Gabriel Sagard-Theodat wrote of "infinite multitudes," and Cotton Mather described a flight as being about a mile in width and taking several hours to pass overhead. Yet by the early 1900s no wild passenger pigeons could be found. One of the last authenticated records of the capture of a wild bird was at Sargents, Pike County. Ohio, on 24 March 1900. Only a few birds still survived in captivity at this time. Concerted searches were made and rewards offered for the capture of wild passenger pigeons. From 1909 to 1912, the American Ornithologists' Union offered $1,500 to anyone finding a nest or nesting colony of passenger pigeons, but these efforts were futile. Never again would man witness the magnificent spring and fall migratory flights of this swift and graceful bird. Attempts to save the species by breeding the surviving captive birds were not successful. The passenger pigeon was a colonial and gregarious bird and needed large numbers for optimum breeding conditions. It was not possible to reestablish the species with a few captive birds. The small captive flocks weakened and died. See a 360 Degree View of Martha, the Last Passenger Pigeon. The passenger pigeons or wild pigeon belongs to the order Columbiformes. Its scientific name is Ectopistes migratorius. Ectopistes means "moving about or wandering," and migratorius means "migrating." The scientific name carries the connotation of a bird that not only migrates in the spring and fall, but one that also moves about from season to season to select the most favorable environment for nesting and feeding. The physical appearance of the bird was commensurate with its flight characteristics of grace, speed, and maneuverability. The head and neck were small; the tail long and wedge-shaped, and the wings, long and pointed, were powered by large breast muscles that gave the-capability for prolonged flight. The average length of the male was about 16½ inches. The female was about an inch shorter. The head and upper parts of the male pigeon were a clear bluish gray with black streaks on the scapulars and wing coverts. Patches of pinkish iridescence at the sides of the throat changed in color to a shining metallic bronze, green, and purple at the back of the neck. The lower throat and breast were a soft rose, gradually shading to white on the lower abdomen. The irides were bright red; the bill small, black and slender; the feet and legs a clear lake red. The colors of the female were duller and paler. Her head and back were a brownish gray, the iridescent patches of the throat and back of the neck were less bright, and the breast was a pale cinnamon-rose color. The mourning dove, Zenaidura macroura, closest relative of the passenger pigeon, Ectopistes migratorius resembles the passenger pigeon in shape and coloring. This has often led to mistaken identification and false reports of passenger pigeons long after they became extinct. The mourning dove is smaller and less brightly colored than the passenger pigeon. The iris of the adult mourning dove is dark brown; that of the adult male passenger pigeon was bright red, and the female’s was orange. The adult mourning dove has a small black spot on its throat below and behind its ear. The passenger pigeon lacked this spot. When rising in flight, the mourning dove makes a whistling sound with its wings, whereas the passenger pigeon did not. The juveniles-of the mourning dove and passenger pigeon resembled each other more closely than did the adults. The young mourning dove does not have the black spot on its neck. The iris of the young passenger pigeon was a hazel color. The range of the passenger pigeon in its migrations was from central Ontario, Quebec, and Nova Scotia south to the uplands of Texas, Louisiana, Alabama, Georgia, and Florida. Only a few birds were ever reported as far west as the Dakotas. The main nesting area was in the region of the Great Lakes and east to New York. The main wintering sites stretched from Arkansas to North Carolina south to the uplands of the Gulf Coast states. The habitat of the passenger pigeon was mixed hardwood forests. The birds depended on the huge forests for their spring nesting sites, for winter "roosts," and for food. The mainstays of the passenger pigeon's diet were beechnuts, acorns, chestnuts, seeds, and berries found in the forests. Worms and insects supplemented the diet in spring and summer. In the winter the birds established "roosting" sites in the forests of the southern states. Each "roost" often had such tremendous numbers of birds so crowded and massed together that they frequently broke the limbs of the trees by their weight. In the morning the birds flew out in large flocks scouring the countryside for food. At night they returned to the roosting area. Their scolding and chattering as they settled down for the night could be heard for miles. When the food supply became depleted or the weather conditions adverse, the birds would establish a new roosting area in a more favorable location. 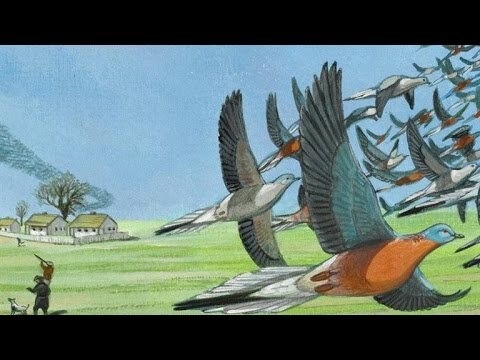 The migratory flights of the passenger pigeon were spectacular. The birds flew at an estimated speed of about sixty miles an hour. Observers reported the sky was darkened by huge flocks that passed overhead. These flights often continued from morning until night and lasted for several days. The time of the spring migration depended on weather conditions. Small flocks sometimes arrived in the northern nesting areas as early as February, but the main migration occurred in March and April. The nesting sites were established in forest areas that had a sufficient supply of food and water available within daily flying range. Since no accurate data were recorded on the passenger pigeon, it is only possible to give estimates on the size and population of these nesting areas. A single site might cover many thousands of acres and the birds were so congested in these areas that hundreds of nests could be counted in a single tree. A large nesting in Wisconsin was reported as covering 850 square miles, and the number of birds nesting there was estimated at 136,000,000. The nests were loosely constructed of small sticks and twigs and were about a foot in diameter. A single, white, elongated egg was laid per nesting. The incubation period was from twelve to fourteen days. Both parents shared the duties of incubating the egg and feeding the young. The young bird was naked and blind when born, but grew and developed rapidly. When feathered it was similar in color to that of the adult female, but its feathers were tipped with white, giving it a scaled appearance. It remained in the nest about fourteen days, being fed and cared for by the parent birds. By this time it had grown large and plump and usually weighed more than either of its parents. It had developed enough to take care of itself and soon fluttered to the ground to hunt for its food. Authorities differ as to how many times the passenger pigeon nested in a season. The general opinion was that the birds normally nested twice in a season, but this can neither be proved nor disproved since no accurate records of nestings were made. During the late summer the flocks of passenger pigeons frequently moved about at random in the northern forests in search of food, but as fall approached and temperature changes became sharp the flocks of passenger pigeons began their migration to the southern wintering areas. Because the passenger pigeon congregated in such huge numbers, it needed large forests for its existence. When the early settlers cleared the eastern forests for farmland, the birds were forced to shift their nesting and roosting sites to the forests that still remained. As their forest food supply decreased, the birds began utilizing the grain fields of the farmers. The large flocks of passenger pigeons often caused serious damage to the crops, and the farmers retaliated by shooting the birds and using them as a source of meat. However, this did not seem to seriously diminish the total number of birds. The notable decrease of passenger pigeons started when professional hunters began netting and shooting the birds to sell in the city markets. Although the birds always had been used as food to some extent, even by the Indians, the real slaughter began in the 1800s. There were no laws restricting the number of pigeons killed or the way they were taken. Because the birds were communal in habit, they were easily netted by using baited traps and decoys. The birds were shot at the nesting sites, young squabs were knocked out of nests with long sticks, and pots of burning sulphur were placed under the roosting trees so the fumes would daze the birds and they would fall to the ground. Hundreds of thousands of passenger pigeons were killed for private consumption and for sale on the market, where they often sold for as little as fifty cents a dozen. By 1850 the destruction of the pigeons was in full force, and by 1860 it was noticed that the numbers of birds seemed to be decreasing, but still the slaughter continued. One of the last large nestings of passenger pigeons occurred at Petoskey, Michigan, in.1878. Here 50,000 birds per day were killed and this rate continued for nearly five months. When the adult birds that survived this massacre attempted second nestings at new sites, they were soon located by the professional hunters and killed before they had a chance to raise any young. The concerned voices of conservationists had little effect in stopping the slaughter. Finally a bill was passed in the Michigan legislature making it illegal to net pigeons within two miles of a nesting area, but the law was weakly enforced and few arrests were made for violations. By the early 1890s the passenger pigeon had almost completely disappeared. It was now too late to protect them by passing laws. In 1897 a bill was introduced in the Michigan legislature asking for a ten-year closed season on passenger pigeons. This was a completely futile gesture as the birds still surviving, as lone individuals, were too few to reestablish the species. The passenger pigeon's technique of survival had been based on mass tactics. There had been safety in its large flocks which often numbered hundreds of thousands of birds. When a flock of this size established itself in an area, the number of local animal predators (such as wolves, foxes, weasels, and hawks) was so small compared to the total number of birds that little damage could be inflicted on the flock as a whole. This colonial way of life became very dangerous when man became a predator on the flocks. When the birds were massed together, especially at a nesting site, it was easy for man to slaughter them in such huge numbers that there were not enough birds left to successfully reproduce the species. The interests of civilization, with its forest clearing and farming, were diametrically opposed to the interests of the birds which needed the huge forests to survive. The passenger pigeons could not adapt themselves to existing in small flocks. When their interests clashed with the interests of man, civilization prevailed. The wanton slaughter of the birds only sped up the process of extinction. The converting of forests to farmland would have eventually doomed the passenger pigeon. The one valuable result of the extinction of the passenger pigeon was that it aroused public interest in the need for strong conservation laws. Because these laws were put into effect, we have saved many other species of our migratory birds and wildlife.